Caran d’Ache and Paul Smith are pushing their collaboration even further by bringing together the 8 colours of the Edition Two in an exclusive limited edition set. 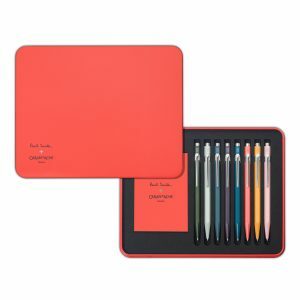 The metal case is embellished with red, a colour close to Paul Smith’s heart, as well to Caran d’Ache’s, and which highlights the eight new colours. Steel point with a tungsten carbide ball ensuring a clean blot-free line. Available refills: M (blue, black, red, green), F (blue, black, red), L (blue, black). With their exclusive products and personalised accessories, “My story to” book-shaped gift sets are a genuine invitation to draw and write your own story. The 849 gets inspired by Paul Smith 2016 fashion trends. This limited edition is available in 8 exclusive shades selected by the English designer. The 849 Paul Smith + Caran d’Ache “Rose Pink” ballpoint pen comes in its matching ultra-thin packaging. Optimal comfort when held in the hand. This pen delivers up to 600 A4 pages, thanks to its acclaimed Goliath ink cartridge. The 849 gets inspired by Paul Smith 2016 fashion trends. This limited edition is available in 8 exclusive shades selected by the English designer. 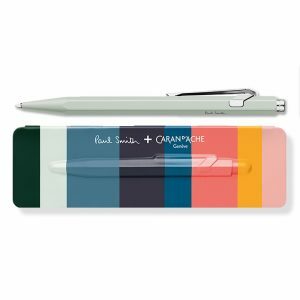 The 849 Paul Smith + Caran d’Ache “Orange” ballpoint pen comes in its matching ultra-thin packaging. Optimal comfort when held in the hand. This pen delivers up to 600 A4 pages, thanks to its acclaimed Goliath ink cartridge. The 849 gets inspired by Paul Smith 2016 fashion trends. This limited edition is available in 8 exclusive shades selected by the English designer. The 849 Paul Smith + Caran d’Ache “Coral Pink” ballpoint pen comes in its matching ultra-thin packaging. Optimal comfort when held in the hand. This pen delivers up to 600 A4 pages, thanks to its acclaimed Goliath ink cartridge. The 849 gets inspired by Paul Smith 2016 fashion trends. This limited edition is available in 8 exclusive shades selected by the English designer. 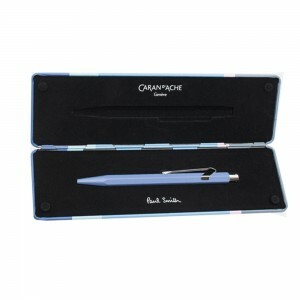 The 849 Paul Smith + Caran d’Ache “Peacock Blue” ballpoint pen comes in its matching ultra-thin packaging. Optimal comfort when held in the hand. This pen delivers up to 600 A4 pages, thanks to its acclaimed Goliath ink cartridge. The 849 gets inspired by Paul Smith 2016 fashion trends. This limited edition is available in 8 exclusive shades selected by the English designer. 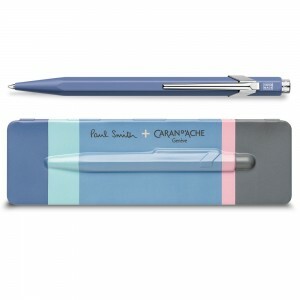 The 849 Paul Smith + Caran d’Ache “Damson” ballpoint pen comes in its matching ultra-thin packaging. Optimal comfort when held in the hand. This pen delivers up to 600 A4 pages, thanks to its acclaimed Goliath ink cartridge. The 849 gets inspired by Paul Smith 2016 fashion trends. This limited edition is available in 8 exclusive shades selected by the English designer. The 849 Paul Smith + Caran d’Ache “Petrol Blue” ballpoint pen comes in its matching ultra-thin packaging. Optimal comfort when held in the hand. This pen delivers up to 600 A4 pages, thanks to its acclaimed Goliath ink cartridge. The 849 gets inspired by Paul Smith 2016 fashion trends. This limited edition is available in 8 exclusive shades selected by the English designer. 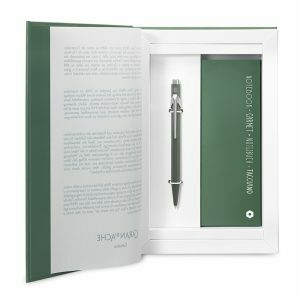 The 849 Paul Smith + Caran d’Ache “Pistachio Green” ballpoint pen comes in its matching ultra-thin packaging. Optimal comfort when held in the hand. This pen delivers up to 600 A4 pages, thanks to its acclaimed Goliath ink cartridge. The 849 gets inspired by Paul Smith 2016 fashion trends. This limited edition is available in 8 exclusive shades selected by the English designer. The 849 Paul Smith + Caran d’Ache “Racing Green” ballpoint pen comes in its matching ultra-thin packaging. Optimal comfort when held in the hand. This pen delivers up to 600 A4 pages, thanks to its acclaimed Goliath ink cartridge. The 849 gets inspired by Paul Smith 2015 fashion trends. This limited edition is available in 10 exclusive shades selected by the English designer. The 849 Paul Smith + Caran d’Ache “Olive” ballpoint pen comes in its matching ultra-thin packaging. Optimal comfort when held in the hand. This pen delivers up to 600 A4 pages, thanks to its acclaimed Goliath ink cartridge. The 849 gets inspired by Paul Smith 2015 fashion trends. This limited edition is available in 10 exclusive shades selected by the English designer. The 849 Paul Smith + Caran d’Ache “Mauve” ballpoint pen comes in its matching ultra-thin packaging. Optimal comfort when held in the hand. This pen delivers up to 600 A4 pages, thanks to its acclaimed Goliath ink cartridge.